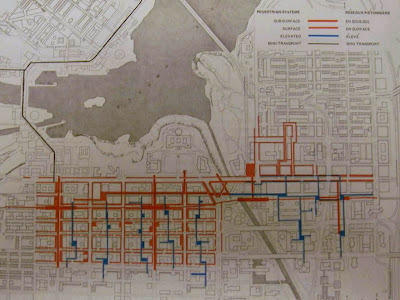 This weekend (May 3-4, 2014) is the annual Jane's Walk Ottawa series of free urbanist walking tours, and as with last year, I'm publishing a list of walks in Somerset Ward. I mentioned two of the walks I went on last year in my blog posts The Lonely Elm (Dennis van Staalduinen's walk on Wellington Street, who this year is giving a walk in Champlain Park) and The stones don't fall far from the hill (Quentin Gall's talk on Ottawa's Building and Monument Stones), both of which seem to have been one-offs. Christopher Ryan had a timely post on Ottawa Start about Connor Court, describing one of the low-rise apartment buildings built in the first half of the 20th Century. As he mentions, O'Connor Street is little more than an onramp to the 417 freeway all the way from the office buildings at the north end through the apartment/commercial district through Centretown. Is this delivery truck at the Delta Ottawa City Centre too big, or is the delivery entrance too small? Either way, it results in the truck blocking the sidewalk completely, and even this short truck diverts pedestrians not just into the roadway, but into the travel lane, to get past. Not the only pedestrian issue at this '60s-built hotel and conference centre. This wasn't the first close call for this building. In January 2007, a rather nasty (though, I understand, non-fatal) collision at this corner tore a traffic signal pole right off its footing and just missed smashing the windows of the art classes. His website is www.FirebySaba.com; an unfortunate name given the circumstances, but arising from his technique. His thickly-covered canvasses are a "controlled riot of colour" (according to the website description), and I'd say some of them are even astral. The first time I met Sabah, he had been in Canada for just two months and had never experienced a real winter. He's easily one of the most interesting and passionate people I've met. In this photo, one of the ones used on Urbsite, we can see how this affects the outside though. As hinted by the phrase "inward-facing merchandise" in Urbsite's caption for this photo, the merchandise is entirely focused on the shoppers inside the skywalk. As if the skywalk doesn't close in the streetscape enough on its own, the Bay's merchandise literally turns its back on the thousands of potential customers outside. It doesn't need to. The little drawings of skywalks envisioned in the '70s showed lots of space around the shopping racks, where shoppers could peruse, peer out, and peer in. The skywalk was an extension of the public realm, but instead it has become part of the closed-off public space. They could have at least hung some display merchandise on the backs of the cabinets to serve as long-distance window-shopping! I highly recommend reading Urbsite's series on the development of the Rideau Centre. It's a fascinating story with many twists and turns (and period images!) Start with part 1 here.